The Seniors Community-wide Shabbat Dinner is a celebration of Jewish pride and culture. Seniors from various facilities around the city join together with volunteers and their families at one central location for a warm and traditional Shabbat dinner complete with a candle lighting ceremony, deluxe three course dinner, speaker and song. Click here for pictures of past dinners. We need 6 volunteers for this event! Please email Chaya@ChabadCV.org if you can volunteer for one (or more!) of the jobs below. # of volunteers Task Thank you for volunteering! 1 volunteer Coordinate the senior homes that will be sending seniors to the event. This Seniors' Shabbat Dinner is being funded by the local community. 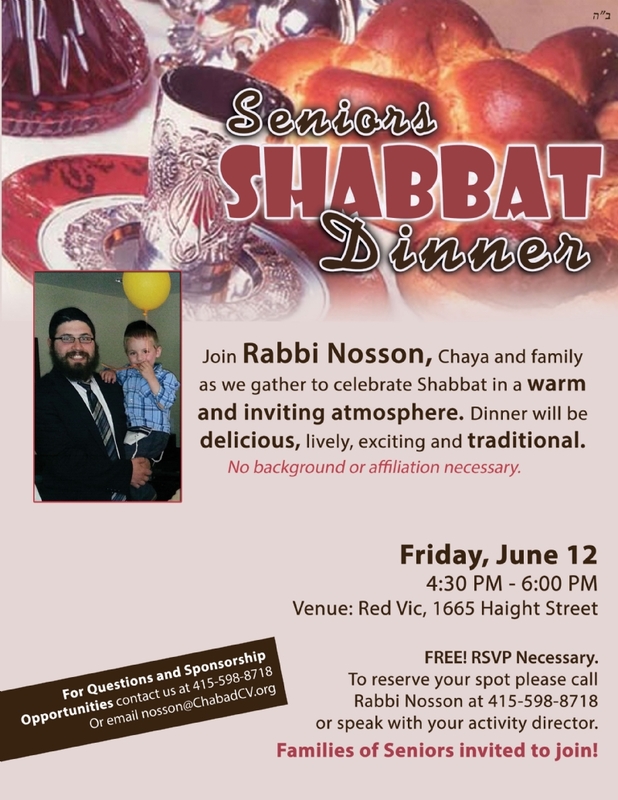 Please consider partnering with us to enable these seniors to experience the joy and peace of a traditional Shabbat dinner. Please note that a donation of any amount is appreciated. Click here to donate online. Please indicate in the "notes" section that your donation should go towards the Seniors' Shabbat Dinner.